The 1-830 series axial displacement transmitter continue the successful line of vibration transmitters designed and manufactured by CEC. The 1-830 series radial displacement transmitter continue the successful line of vibration transmitters designed and manufactured by CEC. These single channel signal conditioners interface with proximity transducers like the 3300, 3300XL and 7200 series or probe types with similar specifications. Each unit provides a calibrated 4-20 mA output that is proportional to the targets axial position as sensed by the transducer and extension system. 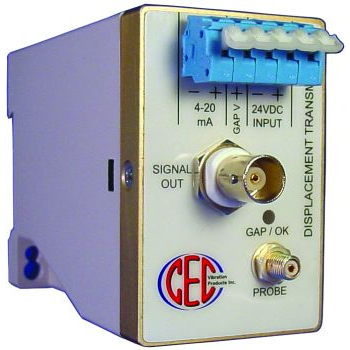 The probe Gap and buffered dynamic signal are easily accessed via the front panel BNC. Probe failure conditions are quickly identified via the multi-colored status LED and the 4-20 mA output. This unique feature allows for instant feedback of the probe system condition during installation or machine operation.